Baking can be a very humbling experience. Despite how many successful bakes one can have, there will always be another hurdle to cross. Praise is often showered no matter how simple the bake is. Bring a tray of the easiest brownies you can make over to your neighbours (they have to be edible at least), they would gush about what an amazing baker you are. Unless of course you have honest-to-God neighbours. We do receive plenty of compliments, which we really appreciate, but they are all taken with a pinch of salt. Because only we know how good we actually are. That’s why we are so fond of Thom & Aimee. It pushes us to experiment with new things, makes us understand our strengths and work on our weaknesses. We are never one to hide that we cannot do certain things and we have had plenty of failed bakes. At times, it becomes upsetting when so much effort, time and money has been used, and only to find that it barely made out of the oven properly. Sometimes they taste good despite their unflattering portraits. Today, we ate the humble cheesecake. Ned has made cheesecakes before, but it was definitely a first that it got a little screwed up. It could be because we didn’t follow the recipe strictly as we did not have certain equipment. At the end, the raspberry gelee had to be made separately and laid on the cake afterwards. Thus, explaining why it is smaller than the cake. Despite how deformed it looks and the problems we faced, the cheesecake wasn’t that bad at all. Albeit a little too stodgy than usual. The flavour of the cream cheese came through and the raspberry gelee was a subtle touch of sweet tartness. Well, we’ll just have to try this recipe one more time in the future to make it right. To make the buttery sweet tart dough, cream the butter until smooth. Add, in the following order: the sifted confectioners’ sugar, ground almonds, and sea salt. Split the quartered vanilla bean in half lengthwise and scrape out the seeds. Add the seeds and the egg, then sift the flour and mix it. Process until the dough forms a ball, then flatten it into a round disk. Wrap dough in plastic wrap and refrigerate for 4 hours or best, overnight. Remove dough from the refrigerator. Roll out the dough between two sheets of parchment paper, into a round disk until it is 1/16 inch (2mm) thick. Line dough in a tart ring and then leave to rest in the refrigerator for 1 to 2 hours. Put parchment paper on the top of the dough and place baking beans over the parchment paper. Bake for 20 minutes, then take the parchment paper and baking beans off. Bake further for 10 to 13 minutes, or until golden brown. Allow to cool in tart ring. Allow the dough to cool, then break it into prices and place it in a food processor. Grind it to a powder. Mix the softened butter and blend until the butter is fully incorporated into the crumbs of the dough. Cover a baking sheet with parchment paper. On the paper, place a 9 1/2 inch diameter (24cm) pastry ring. Spread the dough mixture inside the ring, patting it down with your hands. Refrigerate for 1 hour. Place the lined baking sheet with the pastry ring in the oven and bake for 12 minutes. Remove from the oven and allow to cool inside the ring, and on the baking sheet. To make the cream cheese filling, place the cream cheese and superfine sugar in a bowl and mix for 2 minutes. Add the egg yolks, eggs and cream. Mix until the mixture is smooth. Add the flour and mix until just incorporated. Reduce the oven temperature to 90C. Pour the cream cheese filling onto the cooled pastry base in the ring on the baking sheets. Bake for 1 hour 45 minutes to 2 hours. If baking for entremets, bake for 1 hour to 1 hour 15 minutes. 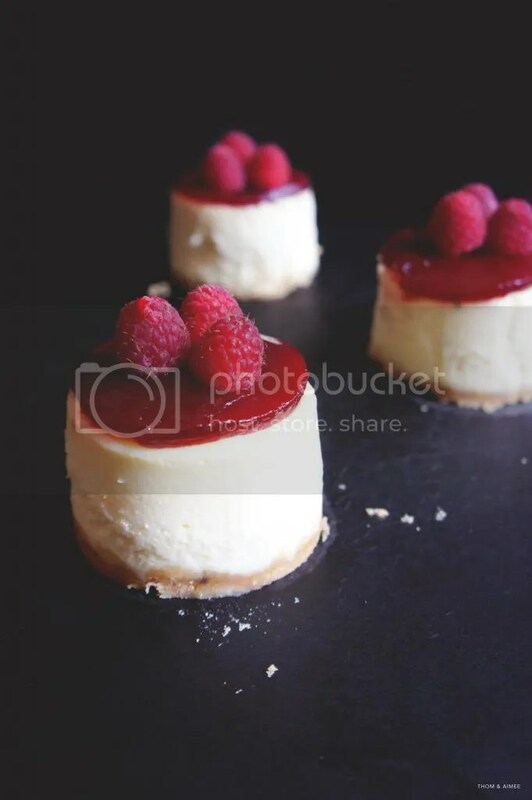 To check for doneness, the cheesecake filling should not wobble and edges are set. Remove the cheesecake from the oven, set aside to cool, then refrigerate. To make the raspberry puree, combine all ingredients in a nonreactive saucepan. Place over medium heat and cook, stirring occasionally until the berries have oozed out all their juices. Bring the liquid to a boil and continue cooking until the mixture has thickened but is still fairly liquid. Pour the berry mixture through a fine-meshed strainer to remove the seeds, pressing down with a spoon to force the fruit and juices through. Transfer to a covered nonreactive container and refrigerate until ready to serve. The puree will keep well for several days. To make the raspberry puree, place gelatin leaves to a bowl of ice water for 5 minutes. Then place the raspberry puree and sugar in a small saucepan and bring it to a boil. The gelatin leaves should be soft; squeeze excess water from the gelatin leaves and add it to the raspberry puree. Mix well and do not allow it to boil. Pour mixture over cake and refrigerate overnight to set.